Today I’m sharing a secret trick to making the very best Oven Baked Beet Chips possible, at home. One easy step makes all the difference! This summer I have been experimenting with container gardening in ways I never have before. I don’t have a natural green thumb, so to speak, so I was a little nervous at the beginning of the season. However, I felt if I planted all my veggies and herbs in large pots, I might have a better chance of staying on top of my gardening duties. I’ve altered the drainage on several containers to make the soil retain moisture better than they have in the past. I’ve also planted produce I wasn’t sure would thrive in containers, just for the sake of curiosity. My latest discovery is that beets grow rather well in pots! In fact, you can reseed them 2-4 times throughout the season to keep the beets coming in as long as possible. Like a spectacular Oven Baked Beet Chips Recipe. If you’ve ever tried making a beet chips recipe at home, you might know it can be a little tricky to achieve the right texture. Beets tend to shrivel and stay limp once baked. If you baked them longer in the effort to reach a crisp chip-like texture, they often burn rather than dry as desired, even under low heat. However, after several test batches I discovered that if you sweat some of the moisture out of the beets prior to baking, they retain a better shape and color… and miraculously crisp up! Sweating in culinary lingo, generally means to cook something on very low heat to release moisture. 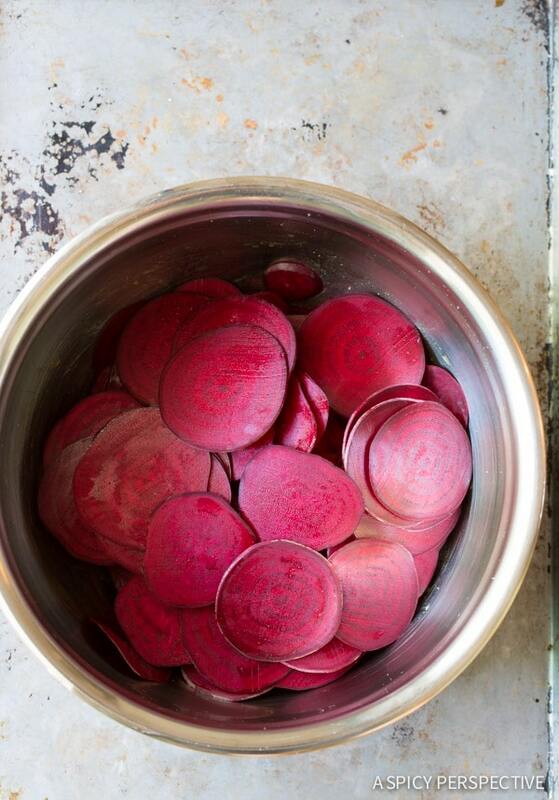 In this recipe, we’re not using heat, but salt, to release the moisture from the beets. I placed thinly sliced beets in a large bowl and tossed them with oil and salt. The oil coats the beets in preparation for baking, while the salt seasons and sweats the moisture out of the beets. After several minutes, the beets have released their excess moisture and are ready for baking in low heat, already being oiled and seasoned. 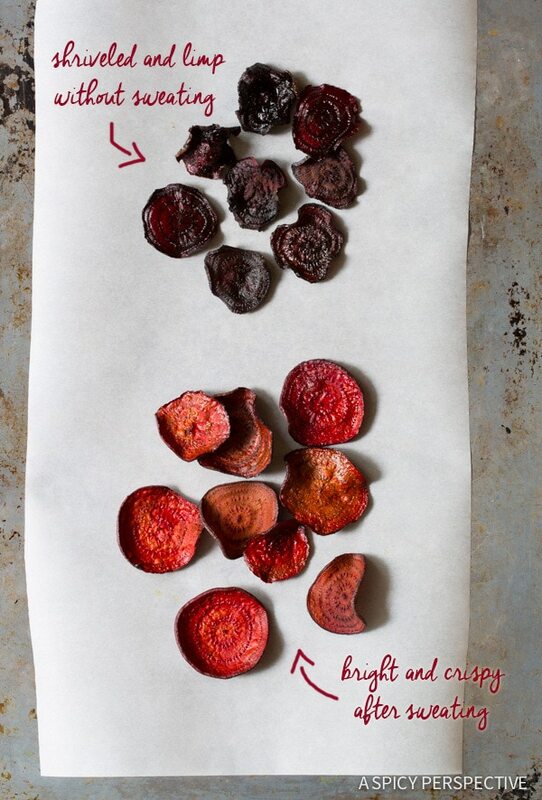 Just look at the difference between a test batch that was sliced, brushed with oil, and salted… And another beet chips recipe batch that rested in the salt and oil prior to baking. Removing some of the water in the beets makes all the difference in size, color, and texture. 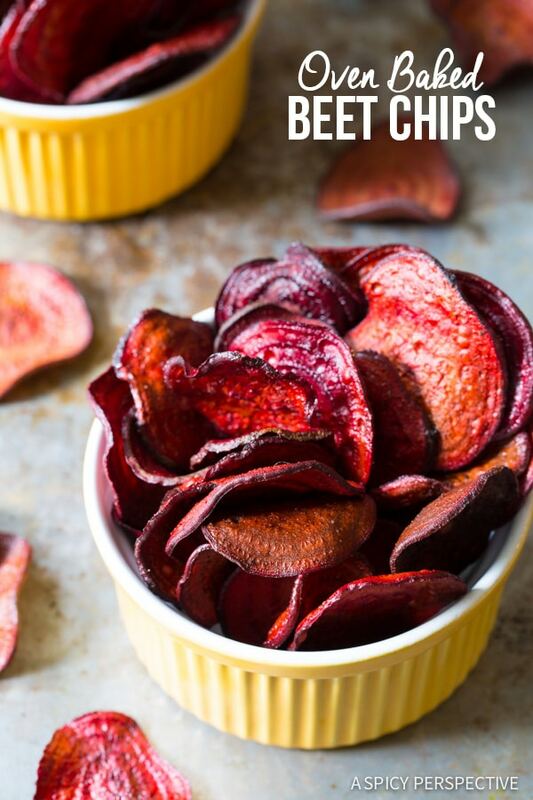 This Oven Baked Beet Chips Recipe will stand up to any gourmet store-bought variety for a fraction of the cost. They are light and healthy, with a fresh garden flavor and fabulously crunchy texture. 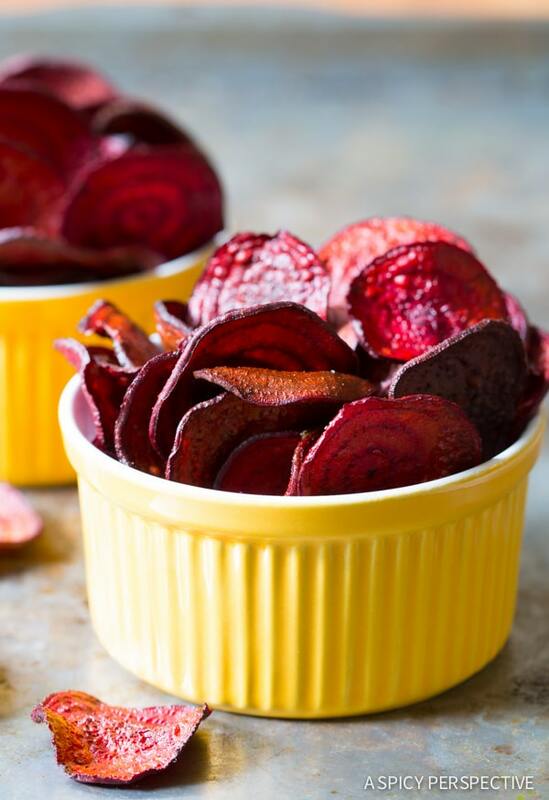 Use your homegrown or farmers market beets all season to make the best Oven Baked Beet Chips Recipe you’ve ever tasted. They store well in an air-tight container at room temperature for up to 2 weeks. However, don’t expect them to last that long. These little guys disappear fast! 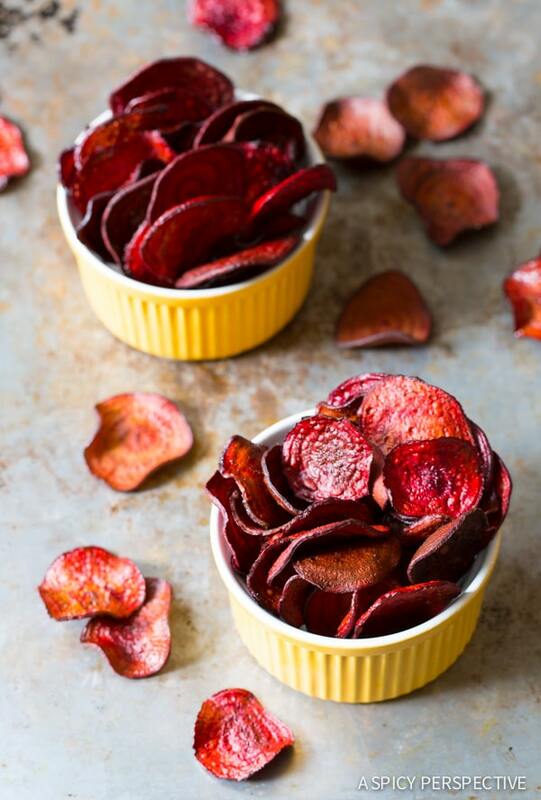 The absolute best Oven Baked Beet Chips Recipe you’ll ever try. We share a baked veggie chip secret that makes this recipe crispy and flavorful! Preheat the oven to 300 degrees F, and line several baking sheets with parchment paper. Scrub the beets well with a veggie brush and cut off the tops. 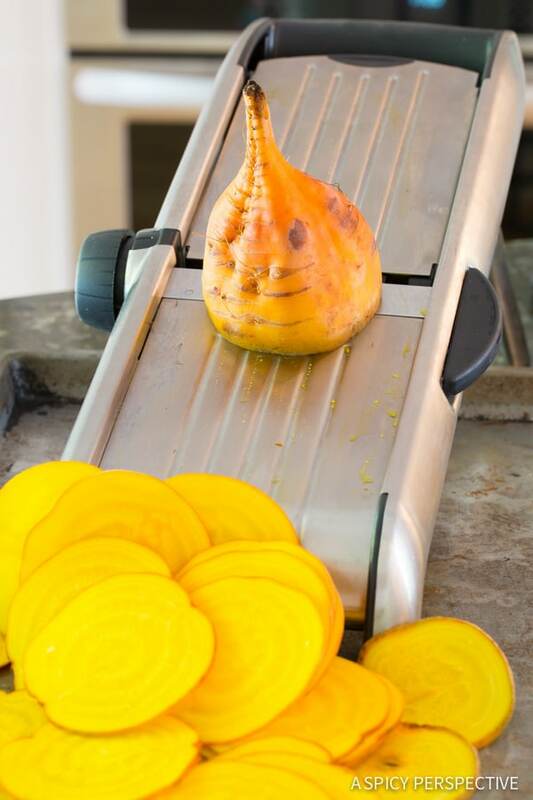 Use a mandolin slicer to slice the beets paper-thin (1/16 inch.) When the beet slices are this thin, there is no need to peel them first. Hold the root end while dragging the beets across the mandolin and watch your finger tips closely. Place the beet slices in a large bowl and pour the oil and salt over the top. Toss well. 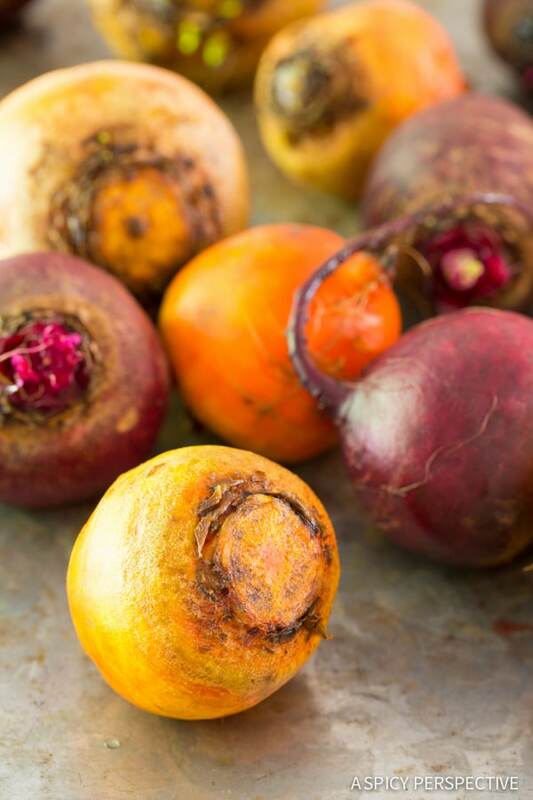 (If using red and golden beets, place in separate bowls and divide the oil and salt evenly.) Ready for the secret step? Now let the beets sit in the oil and salt until they release there natural juices, about 15-20 minutes. This is what allows them to retain a better shape and color. Toss the beets again, then drain off the liquid. Lay the slices out in a single layer on the prepared baking sheets. Bake for 45-60 minutes until crisp, but not brown. Test after 45 minutes and only bake longer if necessary. 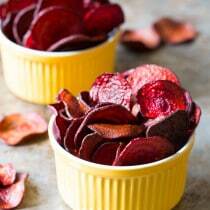 Remove the beet chips from the oven and cool completely before storing in an air-tight container. NOTE: This recipe can be easily halved to make a smaller batch. However, I like making a large batch we can munch on all week.